An OIC (Organization of Islamic Countries) delegation, which included foreign ministers and senior officials from its member states Indonesia, Malaysia, Turkey, Saudi Arabia, Egypt, Djibouti, and Bangladesh recently visited Myanmar. It was led by the OIC Secretary General Ekmeleddin Ihsanoglu. The OIC delegation pressed for unhindered access of humanitarian aid to all affected people and communities, including Rakhine (Arakan) State, without any discrimination. They also stressed the need for clarifying misconceptions and misunderstandings on both sides and for building mutual trust and interfaith community harmony. As has become the norm in this mostly Buddhist country that has come to signify the den of intolerance and hatred of our time, the OIC delegation was, however, met by angry demonstrators, esp. 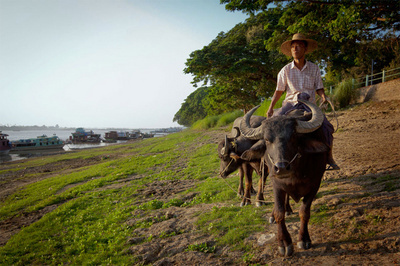 in the Rakhine state, which has seen more than its share of ethnic cleansing of the Muslim minorities. Some 3,000 protesters, led by Buddhist monks, staged their demonstrations in Rakhine’s capital Sittwe (formerly called Akyab) as they toured camps housing mostly displaced Rohingya refugees as well as some ethnic Rakhines and met local officials. The delegation’s visit to Myanmar’s commercial capital Yangon on Friday also saw nearly 1,000 people, carrying "No OIC" placards. The protests of this kind - organized by the members of the central government and local administration, Buddhist politicians and monks - are nothing new. These are a show of defiance against everything noble and humane. These dark, hideous and savage forces of Theravada Buddhism want to hide their monumental crimes against humanity and want to starve to death the remnants of the Muslim minority who mostly now live in abject poverty as Internally Displaced Persons (IDP) in squalid camps. Last year, the Buddhist government similarly did not allow the fact finding missions from international agencies, including the OIC, to tour the ethnically cleansed territories. It also did not allow opening up an OIC office in the Rakhine state. In the midst of government-sponsored protest demonstrations, the OIC had to pack up and leave, which only emboldened the savage regime and its supporters within the apartheid state to repeat their crimes against the Rohingya – who, according to the UN, are the most persecuted people on earth – and other Muslim minorities. As has been noted by the Associated Press on November 24, 600 Rohingya Muslim men were recently thrown in jail in this remote corner of Myanmar during a ruthless security crackdown that followed sectarian violence, and among one in 10 who didn't make it out alive. An eyewitness described that when she visited the jail, the cells were crammed with men, hands chained behind their backs, several stripped naked. Many showed signs of torture. Her husband, Mohammad Yasim, was doubled over, vomiting blood, his hip bone shattered. "We were all crying so loudly the walls of the prison could have collapsed," the 40-year-old widow said. "They killed him soon after that," she said of her husband. Her account was corroborated by her father, her 10-year-old son and a neighbor. "Other prisoners told us soldiers took his corpse and threw it in the forest." "We didn't even have a chance to see his body," she said. In early November, three Rohingyas were killed. One Rohingya man was murdered by Rakhine villagers when collecting firewood in the forest. Another two were killed and four wounded after riot police opened fire during clashes. In Pauktaw Township the situation remained tense with many of the remaining Rohingya villagers being forced into an IDP camp allegedly for their own security by army and police. Many are afraid because the camp, funded by an international aid group, is very close to a village with only Buddhist Rakhines. Buddhist security forces have been allowed to operate with impunity. As a result of such brutality, unfathomed discrimination by state authorities and their obvious collusion with the Rakhine (Magh) extremists towards never-ending pogroms life has only gotten worse for Rohingya. They see no way out but to board rickety boats for Bangladesh, or make the perilous journey to Malaysia. Many have already drowned trying when their boats capsized. In spite of Myanmar’s Government’s zealous efforts to hide its complicity and crimes against humanity, truth has been leaking out. Consider, for instance, the testimony of Mr. Thomas H. Andrews, President and CEO of United to End Genocide on September 19, 2013 in front of the U.S. House of Representatives Committee on Foreign Affairs, Subcommittee on Asia and the Pacific. In that, he provided his first-hand account of visits made in Burma. He travelled to Rakhine State in the west where he visited eight IDP camps and spoke with dozens of desperate IDPs. He also travelled to the central and northern area of Mandalay and the city of Meiktila where he visited neighborhoods and met with many people and families who continue to live in fear and desperation. He also came across Muslims in Rangoon whose fear and intimidation was on the rise in Myanmar. During his trip, Mr. Andrews was blocked by security forces at roadside checkpoints from visiting IDP camps. The reason was clear. They did not want him to hear what had happened to the Muslim community inside Myanmar. Nevertheless, the signs of destruction were everywhere and he was able to see burnt out buildings and destroyed Mosques, meet with those who had to literally run for their lives after watching their homes and everything that they had worked for destroyed. They were living in abject poverty in makeshift camps wanting desperately to return and rebuild their village but also utterly terrified by the Buddhist mobs, Myanmar security forces and police even more. Throughout his travels, Mr. Andrews heard stories of systematic discrimination, isolation and blanket oppression where every aspect of life of members of the Muslim minority was controlled. People described living in constant fear of violence within their communities and intimidation by authorities. The right to move from one village – or even one street – to another, the right to earn a living, to get married, to have more than two children and even the right to live with one’s own family was often dependent on the permission of authorities and most often only after the payment of bribes. 3) Radical nationalist monks arrive at the designated time and deliver fiery hate-filled speeches warning that Muslims are plotting to destroy Buddhism and take control of the nation. Villages are encouraged to support the movement by signing petitions, and displaying “969” stickers on their homes and businesses. They are encouraged to only patronize those who displayed the stickers and boycott any Muslim owned or operated business. As I have documented earlier, the hateful rhetoric of these radical Rakhine monks and the “969” campaign is ominously reminiscent of the hateful propaganda directed at the Tutsi population and their sympathizers in the lead up and during the Rwandan genocide, let alone the Nazi-led Holocaust more than half a century earlier. Demanding the expulsion of all Rohingya from Burma, these monks urge the local population to sever all relations with not only the Rohingya, but also with what are described as their “sympathizers”. Labeled as national traitors, those Buddhists who associate with Rohingya Muslims also face intimidation and the threat of violence. Gregory Stenton, President of Genocide Watch, documented eight stages of genocide – Classification, Symbolization, Dehumanization, Organization, Polarization, Preparation, Extermination and Denial. Human rights watchers have long concluded that the Rohingyas are facing genocide in Myanmar, and this crime must be stopped. Last week (Tuesday, November 19) the U.N. General Assembly's human rights committee passed a resolution urging Myanmar to give the stateless Rohingya minority equal access to citizenship and to crack down on Buddhist violence against them and other Muslims. In its response, an official of the Myanmar government said that it will not allow itself to be pressured by a U.N. resolution. Presidential spokesman Ye Htut insisted in a posting on his Facebook page that the government does not recognize that there is a group called Rohingya, referring to them instead as Bengalis. As I have noted above, such defiance by the rogue Myanmar regime is not new and unless checked vehemently it will continue to defy the world community. The elimination of Muslims there has become a national project enjoying widespread support from Nobel disgrace Suu Kyi to president Thein Sein. Thus, the UN has to go beyond passing soft resolutions that don’t bite the rogue regime. A reading of history shows that genocide succeeds when state sovereignty blocks international responsibility to protect its persecuted group. It continues due to lack of authoritative international institutions to predict it and call it as such. It happens due to lack of ready rapid response forces to stop it and lack of political will to peacefully prevent it and to forcefully intervene to stop it. The time for soft talk with Myanmar is over. It is high time for the UN Security Council to authorize armed intervention in Myanmar by a UN force under Chapter Seven of the UN Charter. The Mandate must include protection of Rohingya civilians and humanitarian workers and a No Fly Zone over the Rakhine state. The Rules of Engagement must be robust and include aggressive prevention of killing. The major military powers (e.g., the USA, Russia and the UK) must provide leadership, logistics, airlift, communications, and financing. If Myanmar will not permit entry, its UN membership should be suspended. Myanmar’s leaders should be tried in an international criminal court for committing and aiding crimes against humanity. Nothing short of these will be able to stop these savage criminals. Sooner the better!